The Louisville Leopards Boys Varsity Basketball Team fell to the host Perry Panthers 36-32 Tuesday Night at Perry High School. With the loss, Louisville drops to 1-2 on the young season. Spencer Hall scored 10 of his game-high 15 points in the first half to lead the Leopards. Cam King hit Louisville’s only three-pointer and finished with 6 and Jared Mathie also added 5. The Panthers jumped out to a 16-9 lead at the end of the first, but the Leopards rallied back to knot the game at 22-22 early on in the third quarter. Louisville snatched the lead in the waning seconds of the period when Hall posted up for a lay in. LHS took a 25-24 lead into the final eight minutes as a result. 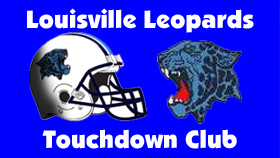 The Leopards defense held the Panthers to just 2 points in the third quarter and shut them out from the field. Louisville pulled ahead 30-25 midway through the fourth quarter, but Perry answered with 6 straight points and closed the contest on an 11-2 run to win their home opener. Despite only 36 points, the Panthers had 3 players reach double figures. Jackson hit a pair of three-pointers and finished with a team-high 11. Haynes and Toles also added 10 each. UP NEXT: The Leopards will next host the Austintown Fitch Falcons for their home opener on Friday, December 7. JV will begin at 6:00 PM and Varsity will follow around 7:30 PM. LEOPARDS:Hall 7 1-1 15, King 1 3-4 6, Mathie 2 1-2 5, Chambers 1 1-4 3, Pukys 1 0-0 2, Zuppe 0 1-4 1. TOTAL 12 7-15 32. PANTHERS: Jackson 4 1-3 11, Haynes 5 0-0 10, Toles 2 5-7 10, Hmeidan 1 2-2 4, Davis 0 1-2 1, Stokes 0 0-1 0. TOTAL 12 9-15 36. LEOPARDS: Staley 9 3-4 24, King 3 4-8 10, Hoffman 2 4-4 8, Croxton 3 0-0 7, Adelman 0 2-2 2, Haren 1 0-1 2, Popick 1 0-2 2. TOTAL 19 13-21 55. PANTHERS: Wilhite 3 4-4 13, Huntsman 4 2-3 10, Adkins 2 2-2 6, Armstrong 2 2-3 6, Wagner 2 0-0 5, Hall 0 3-4 3, Price 0 0-1 0. TOTAL 13 13-17 43.